If you’ve had your eye on an upright freezer, there is a nice Sears Freezer Sale today. They are offering a 13.7 cu. 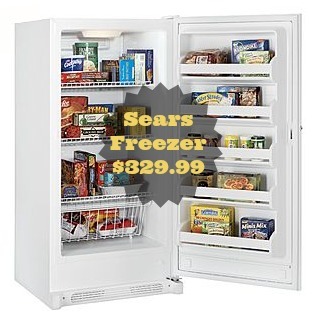 ft. Kenmore freezer for $359.99. The best part is you can also use code 50off300 to get an additional $50 off, making it $329.99! Delivery is $69.99 or you can opt for completely FREE in-store pickup. 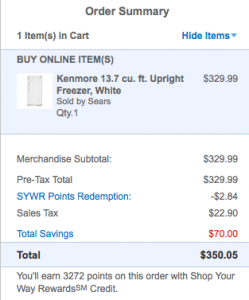 I had a few dollars in Shop Your Way points available for my order too! Freezing meat, milk, produce and other perishable items when they are on sale is a great way to cut down on your grocery budget! This is a daily deal, so this price is good today, 8/15, only.